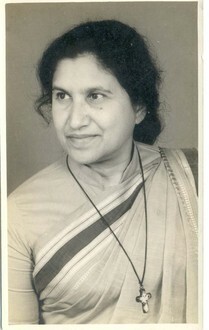 Sr. Noelline Pinto was born 15th August 1927 in Revora, Goa. She entered the congregation Sisters of the Cross of Chavanod when she became 18 years old and was working as a teacher by profession and the principal of an English Medium High School in Aurangabad. In 1960 there was some construction work going on at the school building. Because it was the period of drought a lot of men and women from the surrounding villages came to ask her for work. She could not employ everyone but she knew that especially in this season no work would mean for them no money and no food. She was touched by that and made an exposure to some villages. She saw the people living in poverty and suffering under the drought and recognized that even the situation of the people who had studied had not improved. Especially the women had no skills for self-reliance. Grown up in Goa where it is not that poor and the nature is of a lush green, it was the first time she saw something like that. Inspired by that she decided to make her mission the service of the poorest and the marginalized instead of educating the upper classes. For a formation in social science Sr. Noelline went to France to study in the Catholic University of Lyon. With great difficulties she was able to switch on from the teaching profession to social work. When she came back she started what later would become H.O.P.E..
Because there was no money and no resources the idea of what later would become H.O.P.E. started under a tree. 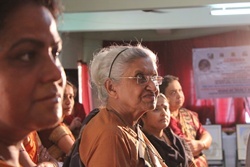 Sr. Noelline gathered women together with the intention to learn from each other. As she asked the women about their interests they said that they would like to learn something by which they could earn their own money. Because some of them had a natural talent for handicrafts they started to teach each other in various skills and to produce different kinds of handicrafts. On her travels in Europe (look at The Founder) Sr. Noelline had contacted some boutiques which were willing to sell some of the articles they received from the women. Later on, after earning the first money and with the kind support of Father Francis D'Sa S.J., who should be named as the Co. Founder of H.O.P.E., the project got some land and a tinshed. Soon Sr. Noelline could amplify her program and offer projects for development of women, women empowerment and organize social actions on different themes. The rest followed. H.O.P.E. has provided 5,000 women with non-formal social and vocational education. Approx. 10,000 children have been cared to in H.O.P.E.’s various institutions, receiving love, care and formation. Up to now, 60 Self Help Groups have been formed with the help of H.O.P.E. and 1,200 women have benefited from it. Since the foundation of H.O.P.E., roughly 5,000 women and 10,000 children have received immediate aid, advocacy and shelter in crisis situations by H.O.P.E. 100 men took the chance and went through de-addiction programs. 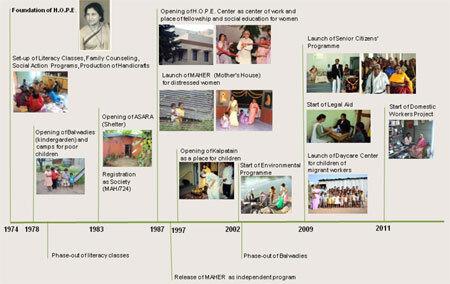 All in all, in the 40 years of H.O.P.E.s work, thousands of poor and illiterate women were able to escape from depressing circumstances and obtained self-reliance and self- employment with the help of H.O.P.E.